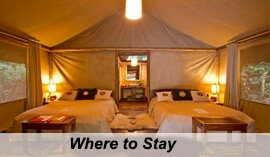 Being the sixth and large National Park in Tanzania, Tarangire National Park is located in the Manyara Region. 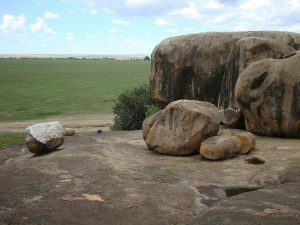 The park covers an approximate area of 2,850 square kilometers and the landscape is composed of river valley, granitic ridges, and swamps. 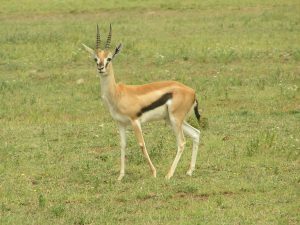 The park is comprised of a mixed vegetation of Acacia woodland, seasonally flooded grassland, Baobab trees and commiphora-combretum woodland. 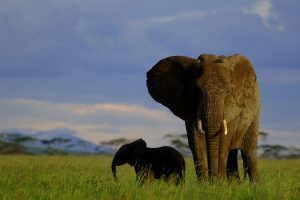 Tarangire National Park was established in 1970 and it is not nearly as world renowned as some of the other parks on the northern country’s safari circuit including the Ngorongoro Conservation Area and the Serengeti National Park. 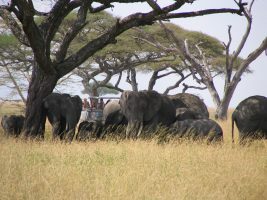 Tarangire National Park’s name originates from the Tarangire River which crosses the park and the Tarangire River is a primary source of fresh water for wild animals in the Tarangire ecosystem during the annual dry season. 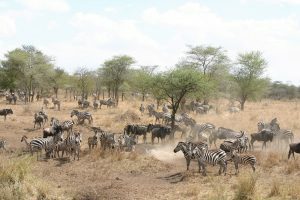 The ecosystem of Tarangire is defined by the long-distance migration of wildebeest and zebras and thousands of animals concentrate in Tarangire National park during the dry season from the surrounding wet season dispersal and calving areas. 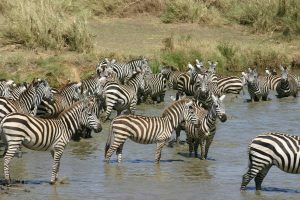 Tarangire National park has a high density of elephants and baobab trees and in dry season that is the month of June to November large herds of thousands of zebras, cape buffalo and wildebeest are also seen migrate to the park. Other animals in the park that are common resident include giraffe, waterbuck, impala, dik-dik, eland, Grant’s gazelle, vervet monkey, olive baboon and banded mongoose. 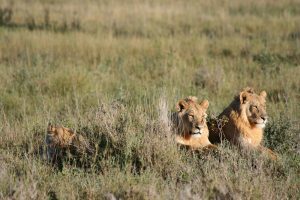 The common predators in the park include lion, cheetah, leopard, honey badger, African wild dog and caracal and the oldest elephant that gave birth to twins is found within the Tarangire National park. 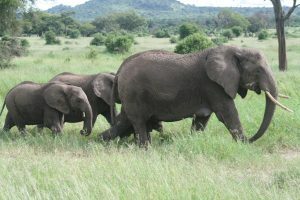 Tarangire national park has a vegetation mixed with seasonally flooded grassland, Acacia woodland, commiphora combretum woodland and Baobab trees. 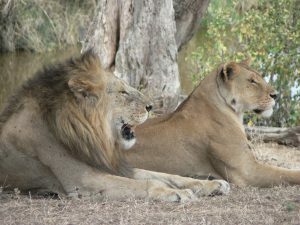 The park is famously known for its 550 species of birds and a haven for bird enthusiasts and it is also known for the termite mounds that dot the landscape, the species that have been abandoned are often home to dwarf mongoose, the woodlands of the park are home to hornbills, hoopoes, brown parrots, and the white-beilied go away bird as well as game birds such as the yellow necked spurfow, and the crested francolin and the other popular inhabitants of Tarangire National park include the lilac breasted rollers, yellow collared lovebirds, hammerkops, kori bustards, the gigantic lappet faced vultures, swifts, mousebirds, steppe eagles among others. 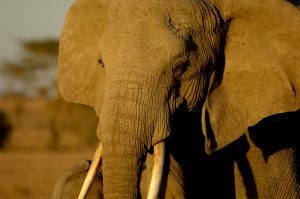 And in the year of 2015 a white giraffe due to leucism was spotted in the park and the current projects research in the park include the Tarangire Lion project, Maasai Giraffe Conservation Demography project and the Tarangire Elephant project. 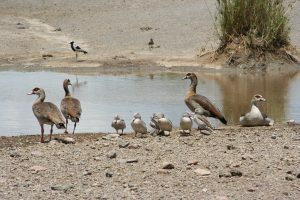 The river stretches about 55 miles and it is the only distinctive feature which is the source of water for both vegetation and wildlife within the park. 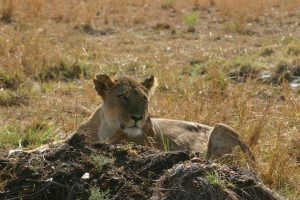 The wildlife is drawn to Tarangire river in the dry season and it is frequently visited by mammals which include wildebeest, lions, leopards, buffaloes, elephants, zebras and areas around the river are being covered with swamps, baobab trees and the yellow barked fever. Burunge circuit area being one of the most breathtaking and magnificent part of the park and dominated by fascinating candelabra tree species, borassus palms and dense woodland giving it a golden touch with an adventurous and remote touch of wilderness. 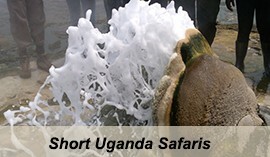 Burunge circuit area hosts wildlife as the leopard, Giraffe, lesser kudu, jackals, elephants, bushbuck and birds such as the palm swifts which nest in the borassus palm trees which do have an edible fruit used to process palm wine. 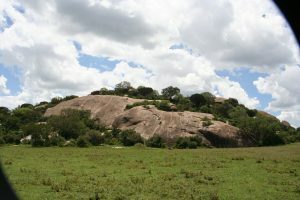 The Kitibong Hill’s area landscape greatly varies with woodland in the western area and acacia in the eastern territory and the hill is famously known for hosting a large herds of buffaloes and the rare wild dogs, there is the Mamire swamp and Gursi swamp in the southeast edges and the area is also surrounded with various pools of water that are formed due to depressions of wallowing elephants and buffaloes that visit the area during dry season and also the giraffe, kudu, warthogs, jackal, impala and bird species such as the ground hornbill. 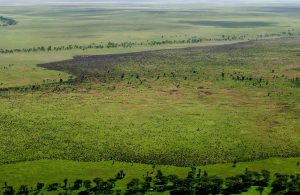 Forming a triangular shade, Lemiyon Triangle lies in the north edge of the park near the village called Kwacuhinja and bordering he Burungi circuit to the west and Matete to the East. 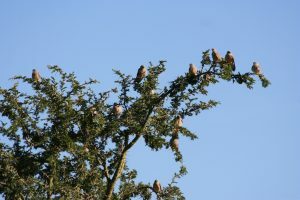 The often-seen bird species in the area is the prey bateleur eagle, the animal species in the area include the elephants, warthog, lions, hartebeest, leopard, genet cat and hyena. 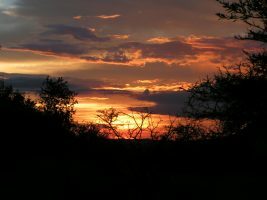 Matete woodland is characterized by tall elephant grass and open acacia woodland and the hosts the rare antelope species called the Oryx and is famously known for its prime leopard viewing spot which is often viewed in the acacia tortillas tree branches. 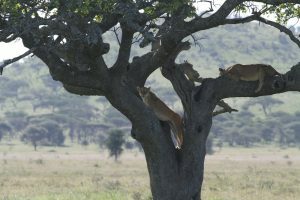 This activity is carried out in the areas of Matete’s open acacia woodland and grassland with the best sight seeing ground for birds in the flat-topped canopies of the acacia trees and the Tarangire River is also ideal for spotting birds such as long crested eagle, bateleur eagle, spotted eagle owl, grey headed kingfisher, African skimmer, Red-chested sunbird, swamp fly catcher, tawny eagle, martial eagle among others. The Game drive activity is carried out in all the parts of the park and the wildlife species viewed include the hyenas, warthogs, buffaloes, lions, elephants, hyenas, Oryx, leopards, kudu among others and the game drive can be done from the matete woodland, Burungi circuit, Lemiyon, Silale swamp, kitibong hill to the Tarangire river. 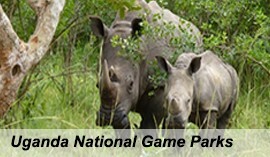 Also, different bird species can be viewed and spotted during the game drive. 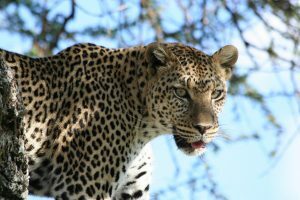 Fly over the park with an amazing experience of having an aerial view at the top of the baobab trees, leopards as they hunt, large herds of elephant and other wildlife as the sun rises for 1 hour. 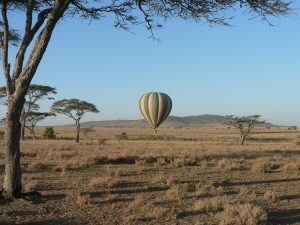 The Hot air balloon gives you an exciting experience of rising high enough to see golden grasslands with dotted giant baobab trees, Tarangire river silver ribbons and its tributaries where the wildlife gather in the early morning to access water, herds of elephants, viewing their grey skins and white tusks as they look up at the balloon from shelter of scrubby acacia woodlands and the blue outline of the great African Rift valley escarpment. 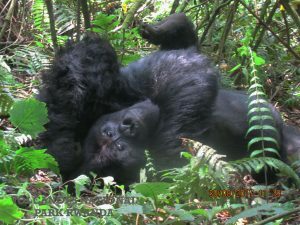 The park can be accessed by road from Dar-es-salaam via Handeni, Kibaya to Babati with a distance of 724 kilometers for 11hours 40min. 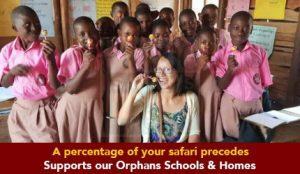 it can also be accessed from Dar-es-salaam via Korogwe, Arusha and Monduli with a distance of 772kilometers for 12hours 30min. 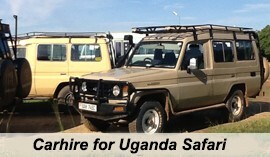 The park can also be reached by air and the air strip is situated in the northern section, Kuro Airstrip in the park.